So credit where credit is due, I first saw this strategy on Twitter while waiting for my round to start at the Guilds of Ravnica Prerelease. Daniel Fournier’s deck seemed so simple, so straightforwardly correct, that it informed much of my last article and gave me kind of a mental baseline for how I would think about this post-Kaladesh / with-Guilds of Ravnica Standard world. Oh, and if the first weekend is any indication, Tokens is the strongest and most important new archetype of the format. Eric Shoopman’s winning list is something like two cards off of the MTGO version Fournier posted the week previous. I mean, what’s an Arch of Orazca and extra Conclave Tribunal between friends? Notable by its absence is Llanowar Elves. As we’ve previously said; sadly, Llanowar Elves is still not the best card in Standard. In this deck, Legion's Landing is simply the better 1-drop. While a single 1/1 creature for one mana isn’t the best deal in the world, when you get it as a bonus, that is a different story. It’s not so difficult to flip Legion's Landing in this structure: Basically everything is fuel. March of the Multitudes: Impossible to answer straight without specialized solutions. More on that in a second. Worse? It’s an instant! March is the closest thing that Selesnya colors may ever get to a Fireball to the Face. Venerated Loxodon: While March is the classic go-wide, Venerated Loxodon helps you go at least a little bit taller in two different ways. Imagine you had an opponent who wanted to make all your creatures take exactly one point of damage; not only would Venerated Loxodon (a 4/4) live through the effect, but it would help whoever helped it to the same resistance. Other than a straight sweeper, there aren’t a lot of cards that are good against the uber-wideness of March of the Multitudes and the pseudo-tallness of Venerated Loxodon. This is especially problematic when you start to consider sideboard cards. Lyra Dawnbringer is a classic tall spell. Vivien Reid is a different type of permanent threat… And even further afield of cards that might be good against go-wide creature offenses. And then there is Settle the Wreckage. Settle seems like it would be one of the cards you’d want most against this kind of deck. You might even side it in in the mirror! Only plays Shalai, Voice of Plenty. You can’t be “target player” while you have hexproof. So as long as you have Shalai, you’re Settle-proof; or, “their best card against you”-proof. The format is brand spanking new, but I’m still wracking my brains as to how to make playing against this deck less draw dependant. I think maybe the fact that so many potential answers to it are luck-based is one of its greatest strengths, and a good reason to sleeve up yourself. Todd’s team “only” finished second; but I do think there is some meaningful tech embedded in the silver medal Standard list. Intuitively, I think I’d want the Maximum Number of both Emmara, Soul of the Accord and Legion's Landing. However, it’s hard to ignore the synergy of Thorn Lieutenant in this strategy. A 2/3 for two mana starts off close to “good enough” to begin with, but the 1/1-making value slots perfectly in to the deck’s Convoke-tokens theme. Subtly, this deck will often have an overabundance of lands due to successful Settles. Thorn Lieutenant’s self-buffing ability gives you something to do with all that extra materiel. So My Guys MIGHT Get Lifelink? Deafening Clarion is such a hoot of a Magic card, isn’t it? I mean, you have the option of giving your guys lifelink. Why might you not want to give them lifelink? There are going to be many cases where you don’t even have a creature in play… You’d still be happy to give your not-creatures lifelink, I think. I mean, the fact that the Boros deck does have creatures is a good place for the proper lifelink granting of this card. If you’re behind… Suddenly you might not be any more. Of course the sweeping aspect of the card is probably going to be even more valuable. But don’t forget you can give your creatures lifelink 1) even if you choose to sweep the leg board, and 2) even if you don’t have any creatures, which you might not, on account of sweeping them all. There is going to be a time or ten where you’ll be happy to go two-three into Deafening Clarion. If that two is Adanto Vanguard you will be able to make it indestructible. You can chop up all the opponent’s creatures (which could be multiple, especially if he’s ); and if you remember to give your Vanguard lifelink, you’ll even get most of your life point investment back come the attack step. While Boros is fast, relatively speaking; it’s the card selection that sets it apart as a deck archetype. None of the Legendary Angels in this deck actually die to Deafening Clarion. So even when it’s not asymmetrical, you can make it feel that way. Just playing a 2/5 (let alone a 5/5) might force the opponent to commit more and more permanents to the battlefield; if they aren’t very big, that’s just more for Clarion to tear up when it drives by. I mean, this card is excellent generally. But a deck that might draw Settle the Wreckage fire? Your Banefires will be big if you want them to be. 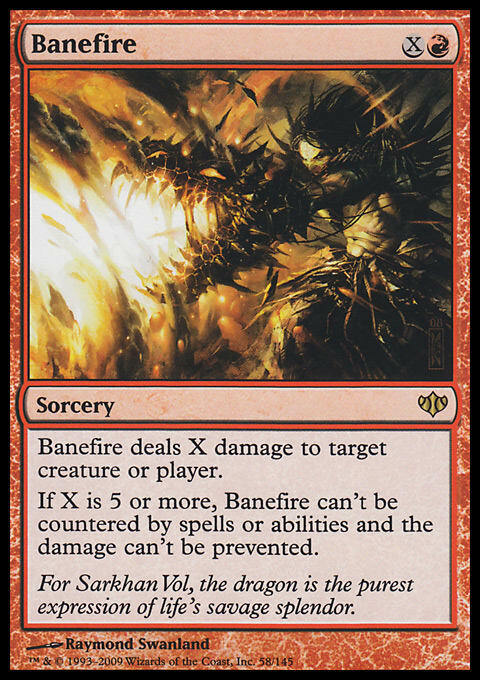 Get some damage in and Banefire will give you an un-counter-able way to finish off Control opponents. They’ll do the favor of making sure they’re big enough, if you let them. I never thought I’d see the day that the small creature Red Deck would be considered the cerebral option, but here we are. Mono-Red might be the brainiest deck in the metagame, both from a construction standpoint, and an execution one. Moreover… It’s not done yet. Boros is a quality creature deck; White creatures with some Red support, and Banefire. But it’s really a dressed up White Weenie deck that is taking advantage of the Block that is currently legal in Standard. The Red Aggro deck is a different animal entirely. It has many advantages, and they all kind of overlap to produce a better and better final product. To begin with, this is a SMALL creature deck; with “small” all in caps. Of its 22 creatures, 8 are 1-drops and another 4 cost two. Not only does it come out fast, but because cards like Ghitu Lavarunner and Viashino Pyromancer are Wizards, Wizard's Lightning gets played at a discount as well. That’s just some good deck-building. But the defining portion of this deck… What makes it different and important come Guilds of Ravnica, is the presence of new card drawing spells Experimental Frenzy and Risk Factor. Remember what we said about how what’s good about this deck-builds on itself? Both these cards really pay you back for having cheap creatures. Let’s start with Experimental Frenzy: When you have this card on the battlefield, everything changes. As long as you don’t get stuck with consecutive lands on top, your opponent can really start falling behind. If you have a 1-drop and another 1-drop, yadda yadda yadda, you can just keep playing cards. It’ll be awesome! Playing out lands and spells will build your material advantages as long as you have untapped lands. Risk Factor has similar advantages. First of all, they’re probably taking four to start. Paying you three cards to start is a disaster when they know you’re about to have a Jump-Start card in your graveyard. Giving you three cards ever is going to be problematic because they’re often going to be a Fanatical Firebrand and a Wizard's Lightning. Rock on, right? What’s coolest is when these two cards come together in a wild tangle of card advantage. When are you potentially in trouble with Experimental Frenzy? Only when you have consecutive lands on top, right? Risk Factor out of the graveyard doesn’t violate the fundamental prohibition of Experimental Frenzy but it does clear the top of your deck. 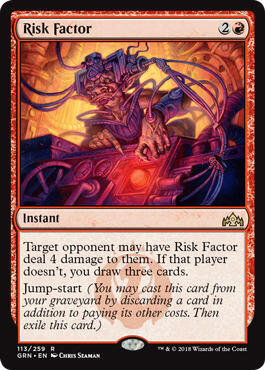 You can’t cast anything out of your hand, so using cards in hand to Jump-Start the Risk Factor is essentially the baseline. All together this is all awesome. Remember what I said about not being done? The Champ McVety played only Risk Factor to clear the top of his deck. There are tons of other playable cards that you might want to include to make Experimental Frenzy even more efficient. Treasure Map, Dismissive Pyromancer, or even some non-Mountain lands can give you some extra oomph at a low cost. One card I think is explicitly missing in McVety’s list is Banefire. I’m extraordinarily high on that card, and I think that it’s a good way to kill Control decks… Especially if you’re doing something like setting up with Legion Warboss. 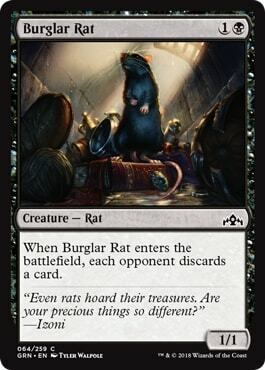 The second I read the words “Burglar Rat” I knew that this was going to be a deck of discipline and quality. Of the twenty-seven creatures in this deck, twenty-four generate card advantage the second you drop them; and the balance are Thrashing Brontodons, which are awesome. I’m not a huge fan of The Eldest Reborn main deck in a format where Tokens is about the best deck, but it is certainly on-theme. I’d actually argue that you want more copies of The Eldest Reborn (at least coming out of the sideboard) for non- matchups. Like the Red Aggro deck, this Golgari compounds its advantages. You start with all these card advantage-generating creatures. They make Vraska, Golgari Queen better. Not only do you have someone to block; but you’re kind of getting “extra” card advantage when you use her [+1] ability. Your Jadelight Rangers, Merfolk Branchwalkers, Vraskas, and the opponent’s combat step are always putting creatures into your graveyard. That is perfect setup for Find // Finality. When you’re Find-ing Jadelight Ranger, you’re further compounding the graveyard sub-theme; maybe even making life better for Golgari Findbroker; and later; Izoni, Thousand-Eyed. From my perspective, of the new strategies peeking out in Standard, this is one of the best places to start. It is not only chock full of card advantage, it’s full of a particular kind of card advantage… The kind that mitigates mana screw early game, that bridges you to the middle turns, and then mitigates flood later. If this deck has a vulnerability, it’s in the opponent going over the top. Izoni is a powerful card, but it still requires you to untap, get a swing in, etc. It’s part Tarmogoyf but mostly Mulldrifter; but in any case, you have to be playing fair Magic to get paid off for including it in your deck. Vraska, Relic Seeker is about the second most powerful thing you can do in Standard right now. But like Izoni, you still need time to build advantages to win. The rest of the deck, while card advantageous, are not so powerful. You can potentially succumb to the speed of one of the Red Decks, or the superior long game of one of the Control decks. can even go wider. But if you’re in a situation where both players are just punching each other one card at a time, you’re going to land more of them. And thanks to choices like District Guide, you’re going to keep playing lands the whole time. One option might be to try Seekers' Squire over Burglar Rat. 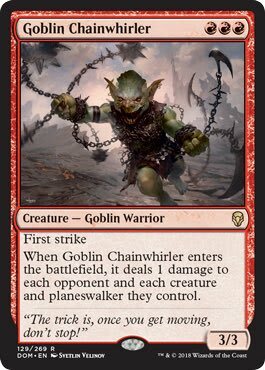 Not only is it a little bit more on-theme with both Izoni and Wildgrowth Walker, Burglar Rat is the only creature in the main deck that is explicitly trumped by Goblin Chainwhirler. That might not matter because its 1/1 body is the least of your concerns (and you probably already got them for a card); but it’s just a thought. Golgari is one of the cheapest decks to sneak in a little extra value against Control. You can stow your Mountain away in the sideboard if you want. You even have District Guide to get you there if their Settles are uncooperative. Up there were only four new decks. There will be more. But the ultimate lesson? This is a whole new world. Old cards are still being played, but they’re being played in new contexts with new incentives. Games might go much, much longer due to all the two-for-ones and implied blocking. The ability to go very, very wide will be an essential part of the metagame. And somehow, some way, the red creature deck is the Valeria Richards of the class. How did that happen? Science experiment gone awry, I assume. At , even.